My name is John Jayaseelan, from the Federal Minister of Foreign Affairs Nigeria. I am contacting you because the Senate Committee on Foreign Relation Matters has officially instructed our good office to carry out a RATIONAL PAYMENTS of Nine Hundred and Seventy-Three Thousand US Dollars ($973,000.00usd) as a form of Rewards/Compensation to all our foreign clients. Your patience was considered worthwhile and thereby has been given a due attention with respect to have endured till this relieving moment. Although some of you may doubt it but unfortunately to them, it is obviously the honest truth. Having assimilated the message above, we advise you send your (1) Your full name, (2) Your Cell phone numbers and (3) Your mailing OR delivery address because the $973,000.00usd has already been processed in an ATM Card and awaits delivery. We have also been assured by the Red Star Express Courier Service (our courier partner) that delivery will get to your designated address within Three (3) official working days. Note that your receiving address is very important as the delivery is programmed to be made to whatever address you provided to us. Please treat this message with utmost importance. Thank you as we wait for your quick response. Scam of the Day 8th May 2016 – Who Is Amy? They all have different phone numbers and are spammed from different spoofed email addresses. A text sent to one of the numbers from a safe anonymous phone gets a response that tries to sign the victim up to a dodgy dating site using their credit card. If you enter your card details then who knows who may have access to them or what they will do with them. This pathetic low life is pretending to be a charity organisation that helps sick children. Not only is he stealing from unknowing victims that only want to help those less fortunate than themselves, but he is also denying help to the real children, by diverting funds to fund his drug addiction or laziness. N.G.O based in the Kambi Bulle village Isiolo County Kenya. HIV/AIDS in Kenya and Africa as a whole. E. We protect the lives of the children against S.T.D and HIV-AIDS pandemic. children in Kenya and other parts of Africa. children that none of us doesn’t know what they will be come in posterity. Email being sent from Renewable Energy Experts – conference5151@gmail.com advertising a non-existent conference, 2nd International Conference on Climate Governance and Mitigation (ICCGM – 2016). There is no conference, the scammer just wants to steal your money by referring you to a fake hotel website that they claim will provide your accommodation. Mail asks victims to contact Dr. Timothy Adams, Conference Secretary by email dr.tim_adams@aol.com. The 2nd International Conference on Climate Governance and Mitigation (ICCGM – 2016) is finally here. Join global experts from the public, private, academia and technology sectors in storming sessions and explore the evolving opportunities in Renewable Energy systems, Climate Change Mitigation techniques, Health, Environmental and Water resource management as well as gain insightful knowledge on the looming uncertainties that evolve round our climate today. There has been an increase in the rate of Environmental pollution worldwide both water and air pollution and displays an increasing trend both in developed and developing countries. In order to provide a steady and sustainable development, organic management systems should address climate change issues that gain increasing importance as the trade becomes more globalized. *Climate Change Mitigation *Flood and Flood Control *Air Pollution and Public Health *Effects of air pollution on public health *Sources of air pollution *Air pollution monitoring and modeling *Air pollution prevention and control *Urban/indoor air pollution and control *Air quality measurement and management *Global Water Resources and air pollution *Renewable Energy Systems *Early warning systems for disaster management *Land and Mud Slides *Role of Science and Technology in climate mitigation *Biodiversity and Forest Management. Other topics related to water pollution: *Water Quality and Public Health:*Purification of drinking-water supplies *Treatment, disposal and discharge of waste-water *New waste-water treatment technologies *Methods of monitoring water quality *Modeling and measuring of water pollution *New water purification technologies *Ground water pollution control *Water resources and quality assessment *Water resource protection and sustainable use *Hydro-biology and water pollution. Proposals for paper presentations, workshops/interactive sessions, posters/exhibits, or colloquies are requested from interested researchers or individuals. Virtual participation is available for those who are unable to attend the conference in person but have an endorsed invitation letter for the conference. Proposal ideas that extend beyond the areas of interest must first be discussed with the conference secretary before being prepared. A few number of Access Grant Award will be granted to Participating Delegates from developing countries attending the conference to cover per diem, flight ticket and registration fees. For more information about the ideas and themes underlying this conference, online registration, accommodation, access grant scholar award and venue, please email the conference secretary: Dr.Tim_Adams@aol.com. Organizers: Renewable Energy Experts – 11, Heddon Street, West Central, London, W1B 4BD, UK. 11, Heddon Street, West Central, London, W1B 4BD, UK. Credit card details are regularly phished, stolen from hacked websites or obtained in other ways. If scammers try to buy something with the card then they will have to deal with getting the item delivered, so it is much easier to get an unsuspecting merchant to charge the card for them and send them some money. If a customer wants to use a particular shipper (or other service provider) and needs you to charge extra to his credit card and forward the extra money to the shipper then it’s always a scam. If a customer wants to use a particular shipper and it is not one that you have a relationship with, then let them make the arrangements and pay for it directly. Variations on this scam include booking/ordering and then having to cancel and requesting a refund by Western Union, Moneygram or bank transfer or possibly ordering high value items and having them shipped overseas. Beware of customers who provide a different card, rather than resolving a simple problem with the one they gave you. This article was first published at ItsAScam.email. If you receive any email that mentions any phone number starting with +4470, then you can be 99.99999999% certain that it is a scam of some sort. +4470 numbers might look like a normal UK mobile phone number (which start with +447), but they aren’t – the +4470 numbers are personal redirect numbers that can be redirected anywhere in the world at no cost to the call recipient. These numbers are like all their dreams come true to scammers located outside the UK as they can now hide their true location and claim to be based in the UK and have a UK phone number to prove it. You may think that you’re talking to Barclays Bank, a UK lawyer or even a member of the UK Government, when in reality you’re actually on the phone to a low-life scumbag sitting in an Internet cafe thousands of miles away. There really is no legitimate use for a +4470 number. No one in the UK needs them as they can easily use their own mobile and if they happen to be overseas and need to receive a call then it would probably be cheaper for them to buy a local SIM card and for their contacts to call that. The only reason to have one is to appear to be in the UK when you aren’t and there really is no legitimate reason for that. +4470 numbers are regulated by PhonepayPlus, who regulate all of the UK’s premium rate services, but it appears that they do nothing to prevent anyone from anywhere in the world getting hold of a number. There are a number of solutions to the problem. Firstly, the UK Government could suspend the numbers all together, which is unlikely to be popular with the companies that offer these numbers as they make a nice profit each time one of them is used (not to mention the loss of taxes the UK Government would make on the reduced phone company profits). If that is a step to far then there are a number of other options. As the calls are designed to allow people to appear to be in the UK and allow UK residents to call them at a lower cost than having to phone overseas, the numbers could be blocked to callers from outside the UK. Add an announcement to all calls before connection, stating the country that the number is being forwarded to. 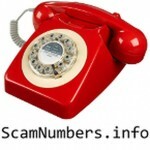 Block the forwarding of the numbers to certain countries that are identified as likely scam hotspots. Require proper registration of the numbers (using provable identification). 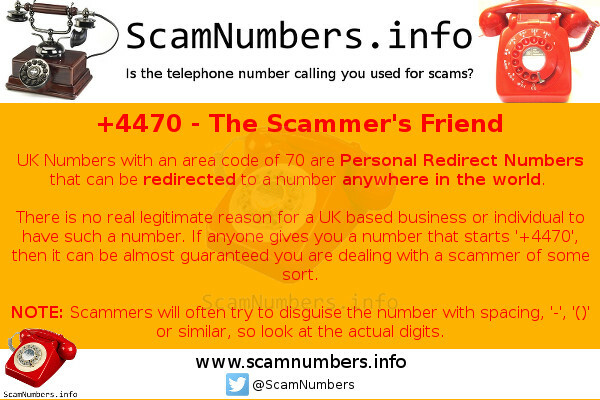 Scammers will often try to disguise the fact that they are using a redirect number by using strange arrangements of the numbers or adding parenthasis, dashes, etc so that the +4470 is not immediately recognisable, so always look at the actual digits in the number.